South Jakarta Bina Marga Sub-Dept. 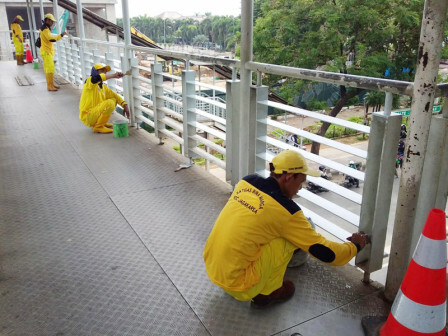 's Jagakarsa Bina Marga Unit personnel beautify Tanjung Barat Station Pedestrian Bridge (JPO).
" We repaint Tanjung Barat Station JPO to make it beautiful"
"We repaint Tanjung Barat Station JPO to make it beautiful," mentioned Inayozi, Jagakarsa Bina Marga Unit Head, Monday (11/5). He explained, 11 Jagakarsa Bina Marga Unit personnel beautify JPO for along 12.5 meters. Previously his side also repainted Lenteng Agung Station JPO. "We repaint those JPOs to beautify and make this city to look more aesthetic," he conveyed.